The New York Daily News perpetrated an interesting, yet subtly misleading headline about president Bush’s Charleston, South Carolina speech on Al Qaeda in Iraq today in theirs titled “W still ties Iraq, 9/11.” Following the left’s playbook of claiming Bush has illicitly linked Saddam’s Iraq to 9/11 their headline made it seem as if Bush, indeed, “still ties” 9/11 to Iraq. It is, of course, a false claim that Bush linked Iraq to 9/11 either then OR now, but the New York Daily News doesn’t seem too interested in the truth. And for the headline to say “still ties” they are certainly saying that Bush is using past tense verbiage. But, for the most part, Bush is clearly talking present tense in his speech and he still never linked “Iraq” to “9/11” in the way the Daily News headline seems to claim. 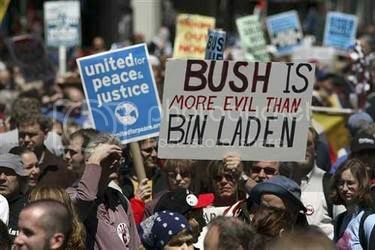 The defeatist’s of the left have always claimed that Bush said Saddam Huessein was responsible for 9/11 and that he used that claim to invade and pursue regime change in that oppressed nation. But, there is no speech in which Bush claimed that Saddam was responsible for 9/11… he just never said it. This is a lie that the left has promulgated since Bush announced we were going into Iraq. As the saying goes, “A lie will go round the world while truth is still pulling its boots on”, and this “Bush lied” lie has practically won the footrace with the truth. Contrary to what the Daily News is trying to mislead everyone into thinking, if one actually reads Bush’s July 24th speech he still did not really link “9/11” to “Iraq.” What Bush really did was link al Qaeda, the al Qaeda that is in Iraq today, to the same network controlled by Osamma bin Ladden, the very same bin Ladden that did take credit for perpetrating 9/11. Bush’s entire focus in his speech was on al Qaeda in Iraq today, not the Iraq of 9/11/2001. In the Daily News’ phrasing, though, Bush is talking about the Iraq of 9/11, not the Iraq of today. Trying again to wrest control of the Iraq war debate from the Democrats, President Bush used a friendly military audience yesterday to repeat claims of a link between the 9/11 attacks and insurgents in Iraq. The Daily News purposefully focuses on the wrong thing here. They focus on 9/11 as if it was Bush’s main point. But it was not as a reading of his actual speech easily reveals. That the al Qaeda we face in Iraq today is the same al Qaeda that Osamm bin Ladden controls and controlled then was the point and 9/11 was far more tangential to his main point. As it happens, it is the Daily News that makes the “ties” and not Bush! Nearly six years after the 9/11 attacks, America remains a nation at war. The terrorist network that attacked us that day is determined to strike our country again, and we must do everything in our power to stop them. …The key theater in this global war is Iraq. Our troops are serving bravely in that country. They’re opposing ruthless enemies, and no enemy is more ruthless in Iraq than al Qaeda. …There’s also a debate about al Qaeda’s role in Iraq. Some say that Iraq is not part of the broader war on terror. They complain when I say that the al Qaeda terrorists we face in Iraq are part of the same enemy that attacked us on September the 11th, 2001. They claim that the organization called al Qaeda in Iraq is an Iraqi phenomenon, that it’s independent of Osama bin Laden and that it’s not interested in attacking America. That would be news to Osama bin Laden. He’s proclaimed that the “third world war is raging in Iraq.” Osama bin Laden says, “The war is for you or for us to win. If we win it, it means your defeat and disgrace forever.” I say that there will be a big defeat in Iraq and it will be the defeat of al Qaeda. Notice that Bush’s emphasis was all present tense. Notice he said that the al Qaeda in Iraq is but “part of” the same terror network. But, even as it is “part of” he did not say that the al Qaeda branch in Iraq CAUSED 9/11. As you can see, Bush does not link 9/11 and Iraq with al Qaeda as if the 9/11 were planned and controlled from Iraq as the Daily News would have you believe. What he did was say that the al Qaeda that planned 9/11 has a branch in Iraq and always has had one in Iraq. You see, Bush didn’t just link the al Qaeda branch in Iraq to 9/11 directly at all other than to say they are part of the same general movement. Bush went on to give a comprehensive history of al Qaeda in Iraq as well as a detailed description of how we have repeatedly cut the head off that snake. He clearly demonstrates that al Qaeda is in Iraq and that they wish to make Iraq a major battlefield of the war on terror. But, the New York Daily News isn’t done getting their digs in at Bush just yet. After improperly claiming that Bush linked 9/11 to Iraq, they next go on to attack where Bush gave the speech, as if the locale of the speech itself made Bush’s facts somehow wrong or suspect. The Daily News tries to create an air that the military audience itself somehow makes the speech illegitimate. Observers have noted that Bush seeks out military audiences the way President Richard Nixon traveled abroad to escape fallout from the Vietnam War and Watergate scandal. “He spends almost all his time speaking in front of friendly audiences, and there is no more friendly an audience for George Bush than the military,” said Hunter College political scientist Andrew Polski. Shows what they think of our military folks, doesn’t it? Naturally, they attribute this evil plan to that darn Karl Rove! “It’s part of the Rove-ian strategy of trying to control the message,” Polski added, referring to Bush political guru Karl Rove. So, to sum up the Daily News’ lies, they want readers to think Bush linked Saddam’s Iraq to 9/11 when he didn’t and they want people to believe that just speaking before a military crowd makes a speech somehow wrong or a lie. No, the New York Daily News has no agenda, eh? So much for “reporting” the news. Here we have another MSM outlet inventing it, instead. 1 user commented in " NY Daily News Misleads About Bush Linking Iraq and 9/11 "